OnePlus has announced via their Forum that they have settled on the 23rd of April as the date that they will show off their debut handset the One. After an extended campaign of releasing specs in dribs and drabs, the company has also decided against settling on the Snapdragon 800 processor for their handset and decided not to settle and without announcing anything specifically they’ve updated their Google+ profile to include the updated spec. 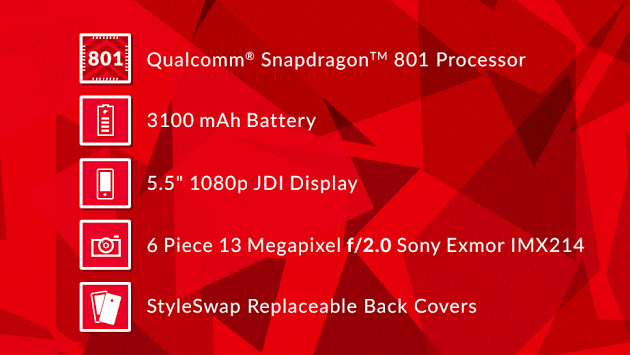 As you can see the final specs released for the OnePlus One which we’ll see on the 23rd of April includes the Qualcomm Snapdragon 801 Processor, 3100mAh Battery, 5.5″ 1080P JDI Display, 6 Piece 13MP f/2.0 Sony Exmor IMX214 Camera sensor for the rear camera and StyleSwap replaceable Back Covers in five different textures – Silk, Sandstone, Denim, Bamboo, and Kevlar. We even have an idea of what the phone will look like thanks to a leaked sketch. At the launch we should get a full rundown on the CyanogenMod software load that will include the hotword activation that should at last look be ‘Ok OnePlus’. With two of the biggest names launching their phones prior to the OnePlus event it will be nice to see the final result of the ‘Never Settle’ campaign.